I love Spinach and Artichoke dip – so much so that I try it at every restaurant that has it on their menu! 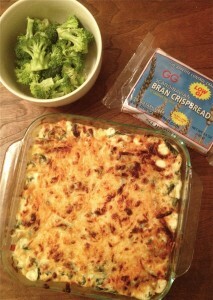 I was nervous to try my own homemade dip but just seconds after taking this creamy dip out of the oven, my roommates and I started to eagerly devour the appetizer, and ate it all in under 15 minutes flat! I hope you enjoy it as much as we did! Carb Light Living™ Tip: If you choose to enjoy the dip with GG Bran Crispbread, two crispbread have a total of 4 net carbs! Enjoy with celery sticks, broccoli, cauliflower or cucumbers for a 0 net carb snack!